Quotes Find: I'm not crazy, I've just been in a very bad mood for 30 years. A collection of Various quotes and sayings on topics including motivational, success, life, leadership, teachers, love, friendship, happiness, success, faith, and nature and more. 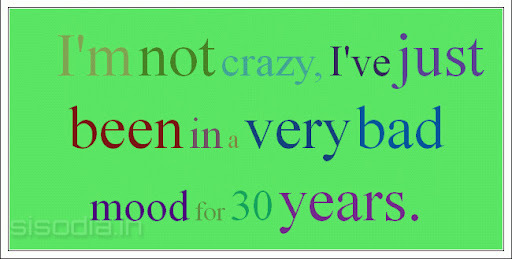 I'm not crazy, I've just been in a very bad mood for 30 years. Goals are deceptive. The unaimed arrow never misses. Choose a job you like and you will never have to work a day of your life. Before they invented drawing boards, what did they go back to? Materialism: buying things we don't need with money we don't have to impress people that don't matter. Write injuries in the sand, kindnesses in marble. Your worst humiliation is only someone else's momentary entertainment. People don't care how much you know until they know how much you care. If you find a four-leaf clover, it means you have entirely too much time on your hands. If a bi-sexual were to turn up missing, would they put his picture on a carton of Half & Half? Before marriage, a man will lie awake all night thinking about something you said; After marriage, he'll fall asleep before you finish saying it. To err is human, but to really screw things up requires a computer. The difference between divorce and legal separation is that a legal separation gives a husband time to hide his money. Heaven is where the police are British, the mechanics German, the cooks are French, the lovers Italian, and all is organize by the Swiss. Hell is where the police are German, the mechanics are French, the cooks are British, the lovers are Swiss, and it's all organized by the Italians! If you always do what you've always done, you'll always get what you've always gotten. I've learned that no matter how much I care, some people are just assholes.